One of the most ancient towns in all of Europe, you’ll find Béziers nestled in the Languedoc-Roussillon region of Southern France. A relatively peaceful town that sees significantly fewer tourists than some of its neighbors, this hidden gem has much to offer the savvy traveler who likes to hunt for under-the-radar attractions. Read on for the top 10 of culture, cuisine, and sheer natural beauty. Situated atop a steep rock face, this impressive thirteenth century cathedral is well worth the climb. The building’s ornate exterior and gorgeous, centuries-old stained glass windows are quietly awe-inspiring, as is the impressive old pipe organ which still resides within the church. This gorgeous old structure is framed by an equally beautiful setting: from the picturesque gardens at the base of the Cathedral, you’ll be surrounded by breathtaking, panoramic views of the French countryside, which are especially magnificent if you pluck up the courage to climb the narrow stairways up to the cloisters. Price and hours: contact venue by phone. Built during the reign of Louis XIV 1667 to 1681 and designated as the Royal Canal during the French Revolution, the Canal du Midi has been recognized by UNESCO as a World Heritage Site since December, 1996. Covering a distance of 240 km, this canal runs ribbon-like from Toulouse, in the Midi-Pyrenees, to just short of Bordeaux, representing a major engineering achievement in French history. Whether you’re dreaming of a romantic walk along the banks at sunset or an adventurous boat tour, following the tree-lined path of this canal will lead you to several sweet villages and gorgeous medieval bridges. Watch out for: the passing cruise barges — unless you’re on one yourself. Housed jointly between two old hotels, the Fabrégat and the Fayet, Bézier’s Musée des Beaux Arts was founded in 1989 to display an impressive collection of European paintings and sculptures dating back to the 15th century. Here you’ll find work from an international range of artists of the Italian, Dutch, Spanish, and French schools, as well as an extensive personal collection of modern art that belonged to Béziers native Jean Moulin, a reverend member of the French resistance during World War II. 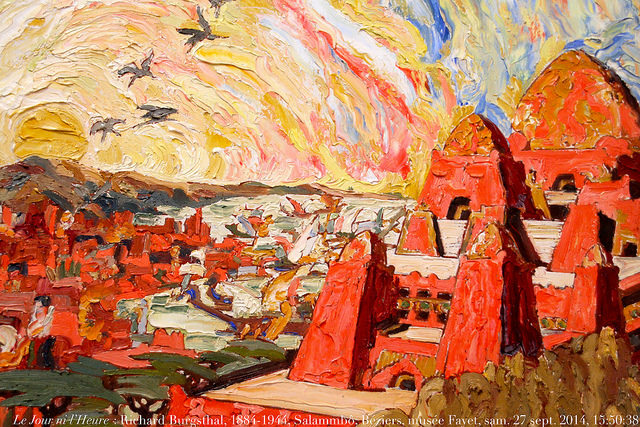 The museum also hosts regular expositions featuring both contemporary and classic artists. June 1 to September 30: Tuesday-Sunday from 10am-6pm. Watch out for: the special temporary exhibits. Just a short drive outside the center of Béziers, the Abbaye de Fontcaude is an important French historical monument in France, and a great place to spend a leisurely afternoon. This exemplary display of Roman architecture has endured a fascinating history, still standing after being set on fire during the religious wars of the 16th century and sold during the French Revolution in the 18th century. Today the Abbaye attracts pilgrims and tourists alike to admire the architecture, the gorgeous view, and the tasty cuisine from neighboring restaurants. Languedoc-Roussillon is one of the world’s biggest wine producing regions, exceeding the production of Australia, Bordeaux, Chile and South Africa combined. Whether your preference is a full-bodied red, sweet rosé, dry white or even bubbly, the region boasts the most varied production of wine in all of France. A visit to any town in this region would therefore be incomplete without at least one proper wine tour. You don’t need to go far from Beziers’ city center to find a winery that provides regular tastings and tours: locally your options include Mas La Chevalière and Safont Jacques, and your choices only multiply as you venture into the surrounding countryside. Enjoy this rare opportunity to learn about how your wine was made as you drink it, and keep in mind that wine sold directly at the source is significantly cheaper than purchasing it commercially. Watch out for: drastically lower prices on typically pricy French wines! 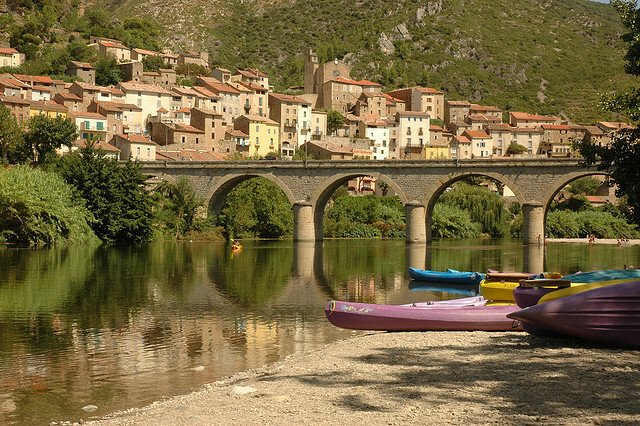 Bike tours are a great, healthy way to explore and interact with the natural beauty of the Languedoc Roussillon region, and Béziers is an ideal starting point for your journey. Relax Bike Tours & Rentals offers both guided tours of the region as well as self-guided bike rentals for more independent travelers, where you can follow the trails along the Canal du Midi to see as much of the area as possible on your own terms. The company will also equip you with baskets to carry your provisions, maps the help navigate your route, and a list of hotels and eateries along the way so you can travel safely and get the most out of your excursion. Stand up paddle boarding has become a very trendy activity over the past few years, and it’s easy to see the appeal: you don’t need to be a seasoned athlete to get the hang of this wonderfully relaxing activity. If you happen to be in Béziers during the warmer months, rent a paddle board or kayak and feel your cares float away as you drift through serene greenery and romantic views of the medieval bridge crossing the canal. About 20km north of Béziers, Roquebrun is a picturesque village in the Orb valley, on the cliff above the river. This is a great place to immerse yourself in the small town charms of Langedoc-Roussillon. This village is home to an especially full-bodied strain of regional wine, and their river is perfect for swimming during the warmer months. Pack your swimsuit and come here for a picturesque picnic along the riverside, uncork a superb bottle of red, and spend a leisurely day basking in the sun. Every year in mid-August, the streets of Béziers come alive for the Feria. A local festival inspired by the Spanish corrida (bull fighting festival), Feria usually begins around the 15th of August and lasts for a full four days. The streets of the city center are lined with endless booths selling food and beer, and after sampling their wares you can join the packed crowd to witness actual bull fighting, along with live music, dancing, and costumes (like human marionettes). If you want the chance to party like a true local, mark your calendar for this year’s Feria. Another major summer festival you don’t want to miss, Saint Peter’s Feast pays tribute to fishermen and to the Mediterranean Sea itself. Spirited processions of clerics and snappily-dressed sailors, rousing music, sports and gastronomic delights are all staples of this week-long celebration at the end of June. The festivities always end with a literal bang every year, in a dazzling fireworks display on Saturday night over the pier.